You’d be forgiven for not realizing that this very strange-looking John Player Norton Replica is, under the skin, a Commando: buyers didn’t know quite what to do with this at the time, either. It’s a bit of an evolutionary “missing link” in terms of sportbike design, effectively bridging the gap between earlier bullet-like dustbin fairings and modern designs as seen on the first-generation GSX-R750. Cutting-edge design unfortunately cuts both ways: while theoretically new ideas should excite consumers, manufacturers always run the risk that their revolutionary machines will actually alienate their core audience. Take the Pierre Terblanche-styled Ducati 999 for example: the bike was, in virtually every way, an improvement over the beloved 916 and the design was a complete departure for Ducati. The 999 is finally, grudgingly being accepted as a classic design but when new it was too much of a departure, too new, too alien to be the follow up Ducatisti were waiting for. And sales were disappointing. 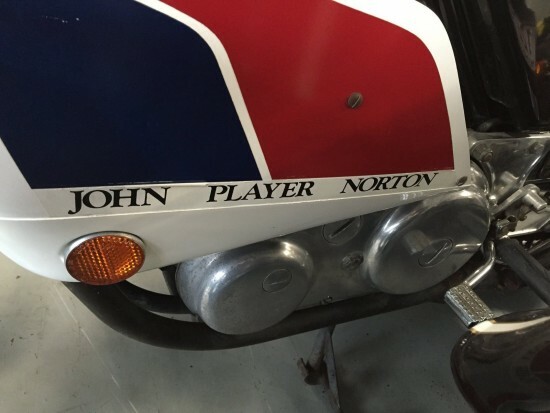 The John Player Norton Replica suffered a similar fate. Named after the famous British tobacco company, the few made didn’t find an audience at first and some languished unsold for years. 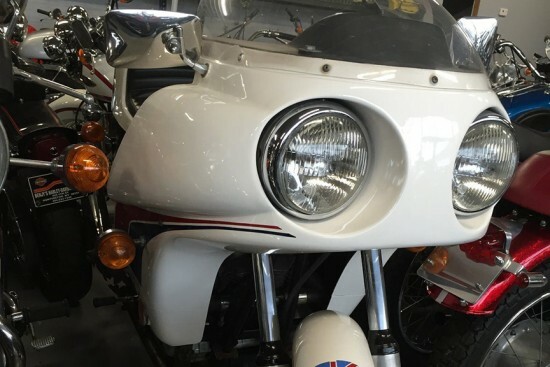 Keep in mind that the whole concept of collectable motorcycles is relatively new, and few people were interested in race-replicas or limited editions. On the upside, if the odd styling captures your imagination, this should offer no real challenge to ride and maintain: aside from gearing changes to take advantage of the bike’s improved top-speed potential, the bike is basically a stock Norton Commando. 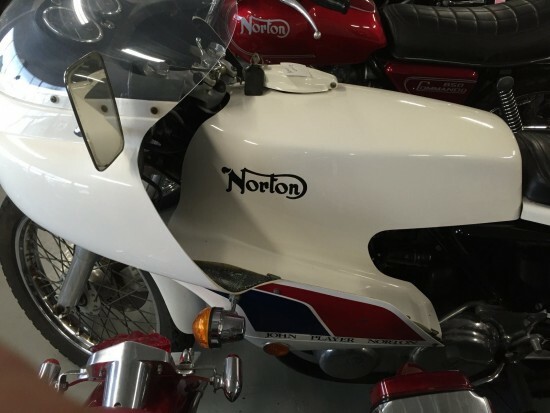 It uses the 828cc version of Norton’s famous parallel-twin engine and four-speed box found in the 850 Commando. 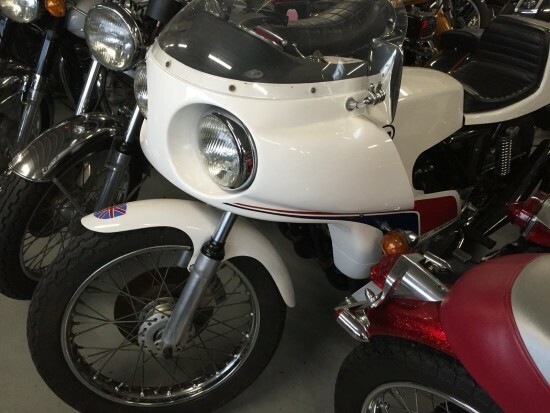 A short-stroke 750 was also available for buyers that planned to race their machines in the US, although I’ve never seen one come up for sale and I’m not sure exactly how many of the 200 total machines took advantage of this option. The seller then goes on to list a number of other vintage machines they have available. Which is great, but a bit of that space could have been used to answer some questions about this machine: does it run? What work, maintenance, or upgrades have been done to the bike in question? Aside from the fact that it has 12,465 miles on it so we know it’s not been sitting its whole life, we’re left to guess. I’m sure the seller is probably expecting prospective buyers to ask appropriate questions. But although these are pretty rare, with just 120 shipped to the US, they’re not impossible to find, and many buyers want to do their initial research without having to reach out to the seller. It’d also be great to see some better pictures of this very distinctive machine, although the close-up shots do show some great detail and give a pretty good idea of the overall condition. 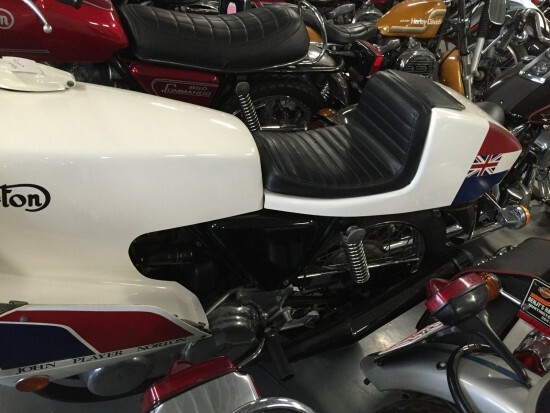 This is one bike in a very large collection being sold by a 3rd party who doesn’t know much about it. Very likely it has been sitting awhile. Asking very top dollar. Pass, unless you can inspect it in person. Yeah, restoring the oily bits wouldn’t be too challenging, but that should push the price down a bit.